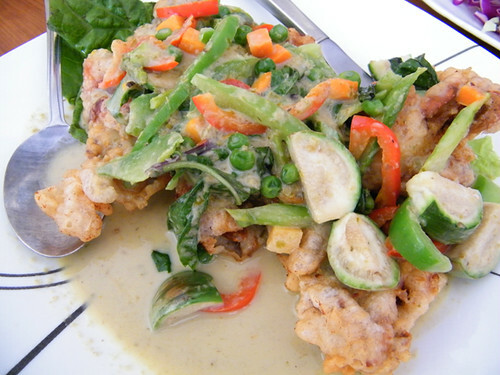 Twenty years ago when I lived in San Diego, my ex-husband and I loved eating at Karinya Thai Cuisine. The restaurant was up the street from our home in Pacific Beach, and it was our “go to” dinner place when we entertained visiting family and friends. 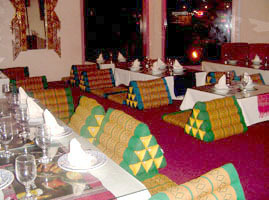 We usually requested to eat in the “traditional” dining room . This meant we had to remove our shoes before going in, and sit on the floor atop beautiful Thai triangle pillows. The first time we invited our buddy Spencer (who was like a second grandfather to me), he laughed when he learned he had to remove his shoes for dinner. And after that first meal at Karinya, anytime we’d make dinner plans with ol’ Spence, he would ask “Are we going to the ‘shoeless place’? …if so, I’ll have to check my socks for holes”. From my research, it looks like the original owners of Karinya sold the business in 1998. 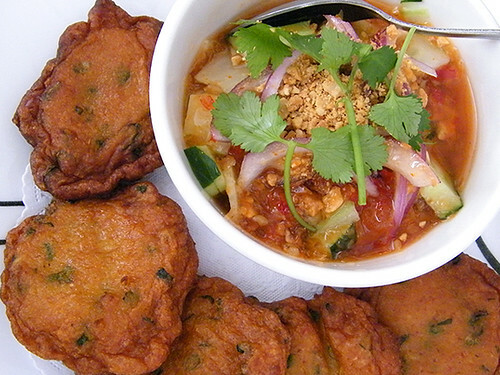 I moved to Studio City in 1994 and halfheartedly tried to find a new Thai restaurant near me (in the San Fernando Valley) to love, but nothing tasted as good or seemed as authentic as Karinya. There were no “foodie” sites on the New World Wide Web way back then, so I had pretty much given up on finding a Thai place I could call my own. 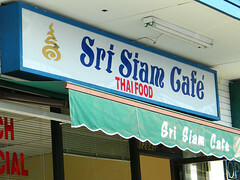 Then on January 1, 2009 I had lunch at Sri Siam Café. Peter (my husband) and I met up with our far-east-food-expert friend Jeffrey, for an incredible, unforgettable New Year’s Day Lunch. Jeffrey is a regular at Sri Siam and has not only eaten at all the best Thai places in Los Angeles but all the best Thai places in Thailand. For me, the fish cakes were just a vehicle for the relish. I ended up just spooning it out and eating it like gazpacho! 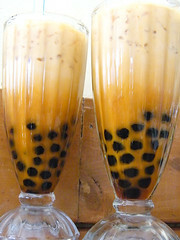 Thai Boba Tea. 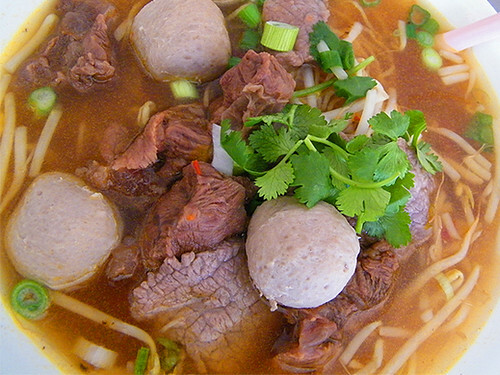 The perfect way to cool off a spicy tongue! This morning my ex-husband Perry called from Santa Monica airport. He and his co-pilot John asked if I wanted to join them for lunch. They fly a private business jet and had a five hour layover, so I grabbed my friend Laur and we met them at Sri Siam! 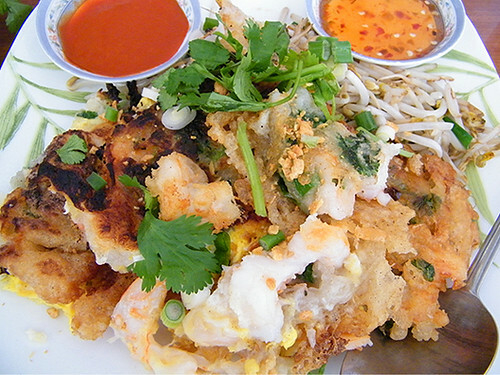 I wrote (above) that twenty years ago, one of our favorite dishes from our old Thai restaurant in Pacific Beach was “Shrimp Sarong”, and that’s the first thing Perry ordered today. 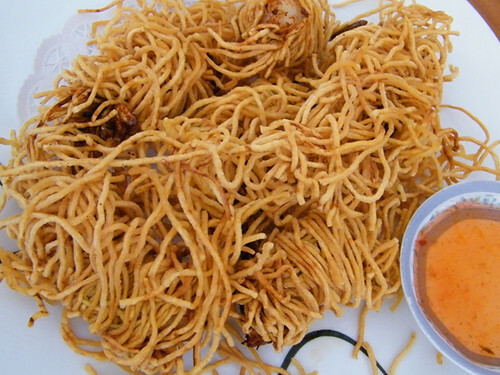 They were exactly the same to me, except Sri Siam calls them “Crispy Shrimps”. It was sort of a sentimental moment for me. Sitting there with Perry eating a wonderful old favorite and talking about our families. He and his wife Karen have two beautiful kids, and I feel so grateful that we can still be in each others lives, especially when it’s over a plate of delicious food! 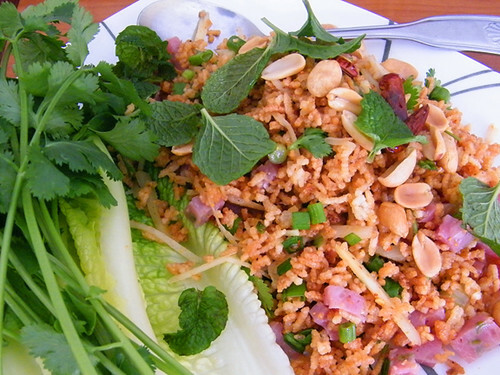 Crispy Rice Salad Thai sour sausage mixed with crispy rice, roasted peanut, ginger and green onion. 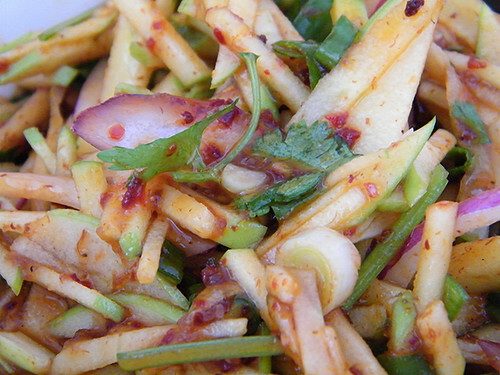 I LOVED the spiciness of this dish. 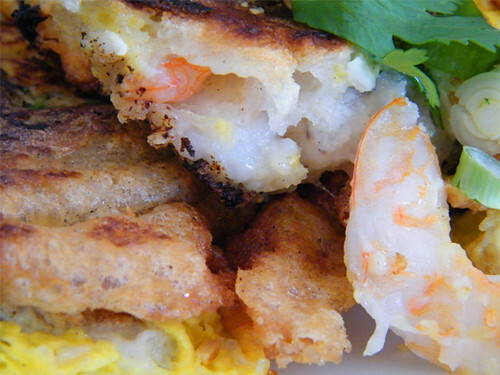 Crispy Shrimps Shrimp mixed with light soy sauce wrapped with egg noodle. Nice find for sure, Jo! Every foodie needs a connection like your friend Jeffrey. 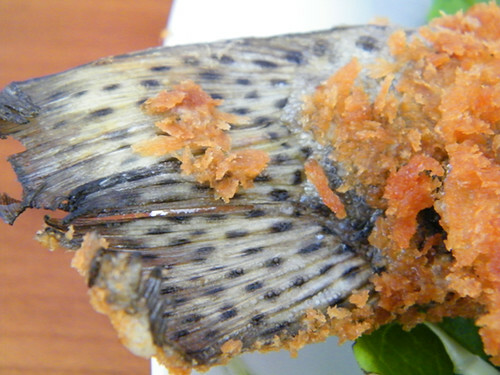 The food looks incredibly fresh, and beyond authentic. I’m constantly amazed by Asian cuisine in that you can visit so many restaurants and continue to see new things on the menu. 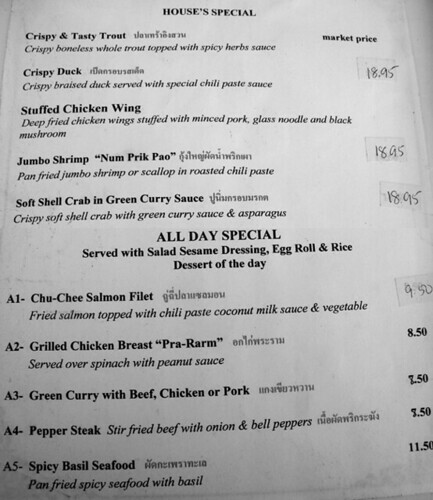 Apple trout, shrimp omelets, green apple salad — all things I’ve never seen on a Thai menu before. I love the story of the Karinya Thai family going on all-day excursions to buy their groceries. That’s why their food is so good. They care enough to get the right ingredients. I was told stories of my great grandmother in Sicily, and what a ball buster she was when she shopped. If she couldn’t get exactly what she wanted, she’d switch up and simply make something else. I’d have loved to have eaten one of her meals. Great post, Jo. Thanks for the heads up on this place. It’s worth the drive, however long it may be for anyone. I find it a true gift that we’re blessed with so many cultures in our country, and that they all share their food with us. Everyone should be so lucky. My little sister bought those pillows in Thailand and now I have been looking everywhere for them. I found them online but they wanted like $80 for them (she paid $12). They are great for gaming and watching TV. 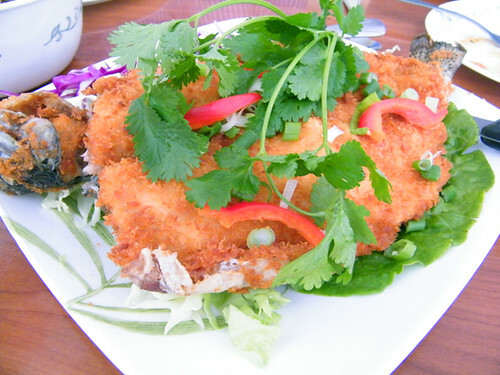 Barbara Hansen turned me on to Sri Siam, and we loved it, especially the crispy rice salad. Now I want to go back for the trout!